Are Ginger Cookies Good for You? Ginger cookies fall into the category of "empty calories," according to the U.S. Department of Agriculture's dietary guidelines. You should consume empty calorie foods in moderation. Columbia College recommends that you allot 260 calories in a 2,000-calorie diet to the foods you want, which can include empty calories. Eating ginger cookies has some major drawbacks because of their fat and sugar content, but they also contain some essential nutrients. 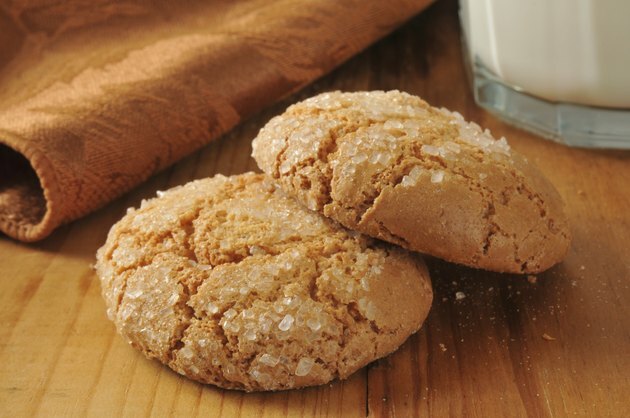 Ginger cookies serve as a moderate source of calories, since a 2-ounce portion of gingersnaps contains 236 calories, while an equivalent portion of gingerbread cookies contains 252 calories. Whichever variety you choose, you'll spend the majority of your discretionary calories for the day in only one serving. Both types of ginger cookies are moderately high in fat, with one serving of gingersnaps providing 5.5 grams of fat and one serving of gingerbread cookies providing 7.3 grams of fat. Fat is calorie-dense, so that even though fat serves as a potent source of energy, it is also easy to overeat when you consume foods that have a lot of fat. Additionally, the saturated fat found in both types of ginger cookies negatively affects your blood cholesterol, which can put you at risk for cardiovascular disease. Ginger cookies also contain significant amounts of sugar, thanks in part to the added table sugar and molasses that sweeten them. Eating 2 ounces of gingersnaps boosts your sugar intake by 11.3 grams, while gingerbread cookies contain 10.9 grams of sugar per serving. This sugar increases the level of acidity in your mouth, which dissolves the enamel covering your teeth and contributes to tooth decay. Because it's high in calories, sugar also contributes to obesity, and might increase your risk of cardiovascular disease. Despite their drawbacks, ginger cookies offer some nutritional value, and boost your iron and manganese intakes. Iron plays a key role in energy production, and it supports tissue health by helping red blood cells carry oxygen to your tissues. Gingersnaps contain 3.6 milligrams of iron per serving -- a significant amount toward the 8 and 18 milligrams recommended daily for men and women, respectively -- while gingerbread cookies contain 2 milligrams of iron. Gingersnaps also contain manganese, which is a mineral involved in wound healing and which also supports your metabolism. Each serving contains 882 micrograms of manganese, which contributes 49 percent toward the recommended daily intake for women and 38 percent for men. Ginger cookies also offer beneficial niacin, as well as folate. The niacin in ginger cookies promotes healthy cell development, controls gene activity and aids in cell-to-cell communication. A serving of gingersnaps or gingerbread cookies provides roughly 1.8 milligrams of niacin -- 13 and 11 percent of the daily niacin intakes recommended for women and men, respectively. Both types of ginger cookies also contain folate, which is a vitamin needed for red blood cell production and healthy cell growth. Gingersnaps offer 49 micrograms of folate per serving -- 12 percent of your recommended daily intake -- and gingerbread contains 45 micrograms.